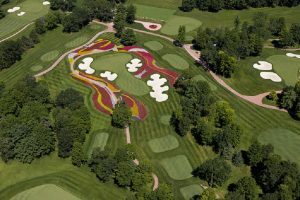 When you visit the SentryWorld course in Stevens Point, WI., there’s always the temptation to get overwhelmed by its world-renowned Flower Hole. I’ve seen lots of beautiful golf holes, but No. 16 at SentryWorld remains my choice as the most beautiful. 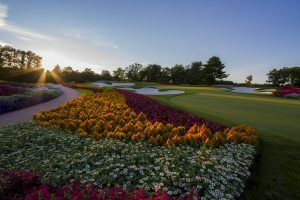 The course opened in 1982 and was recently renovated by Robert Trent Jones Jr. in collaboration with Bruce Charlton and Jay Blasi. I’d planned to make the unveiling of the renovated layout, but it was rained out. An aerial view shows just how extensive the flowering of SentryWorld’s No. 16 is. Still, I can report that the Flower Hole hasn’t lost a thing in the changes. Never the most difficult hole in golf with tee placements ranging from 97 to 176 yards, it now is adorned with over 50,000 flowers. The hole had about 42,000 before the renovation.